Ivorian striker Ahmed Toure was named the Best Player of the 2010/2011 Ghana Premier League season on Saturday night after seeing off two strong contenders. The Asante Kotoko player fend-off competition from Chelsea's Emmanuel Clottey and then Heart of Lions midfielder Gladson Awako to emerge the grand winner. The rest of the categories were dominated by Berekum Chelsea who won the country's league title for the first time. The Berekum-based side took delivery of a new 12-seater van and a cash prize of 15,000 Ghana cedis for winning the 2010/2011 League title. 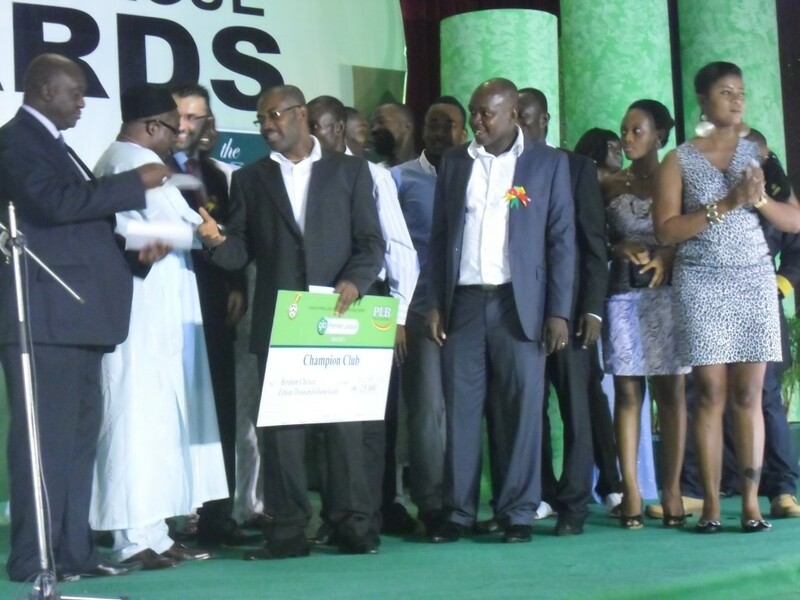 The Best CEO award was handed to Chelsea's Obed Nana Kwame Nketia for masterminding the club's successes. Orlando Wellington was rewarded for guiding Berekum Chelsea to last season's Premier League title by being named the Best Coach. Chelsea's Ernest Sowah was adjudged the best goalkeeper of the campaign while the Best Defender award was handed to Rashid Sumaila of Cape-Coast Ebusua Dwarfs. Berekum Arsenal striker Nana Poku received the non-competitive award as the Premier League's Goal King. His 16 goals in the season under review won the award ahead of closest competitor Emmanuel Clottey of Chelsea who scored 15. Thanx to the PLB for their fairness and hope striker AHMED TOURE will finally naturalised and form part of the 2014 world cup squad for another record to be set in the world stage. How can a player from a relegated treatning team be the best defender? Pls come again. I thank God that all the noise surrounding the amount that the league champs receive has now been made known to the public.Its not Ghc 5000 but rather Ghc 20000 when the five thousand they received at the day of corronation is added to it.